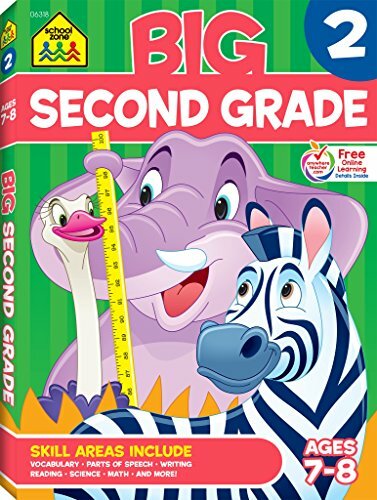 AMAZING - BIG Second Grade Workbook is packed with 300+ colorful exercises that make learning fun! These proven activities will help prepare your child for success by teaching them sentence construction, animal families, map reading, adding and subtracting, solving word problems, two-digit numbers, counting by 2s/5s/10s, even and odd, place value, multiplication, telling time, using calendars, weather, science and more! For second graders ages 7 and 8. WORKBOOKS - Writing in workbook pages, as opposed to typing on a computer, can help kids to focus and to learn. Writing by hand fires up specific areas of a child's brain, improving a child's ability to not only remember what he or she learns but to think of new ideas. When kids complete the workbook, fill out Great Job! You're #1 certificate to reward a job well done. Hang it on the wall or fridge to display their achievement with pride. OUR STORY: Almost 40 years ago, long-time educators James Hoffman, Ed.D., and his wife Joan Hoffman, M.A., began a retail supply outlet for teachers, then soon identified a need for at-home learning materials to help parents support and supplement their children's classroom instruction. School Zone Publishing fast emerged as the market leader in workbooks and flashcards for preschoolers through sixth graders. If you have any questions about this product by School Zone Publishing, contact us by completing and submitting the form below. If you are looking for a specif part number, please include it with your message.